Despite experiencing profound tragedy, Charles Middleburg encourages students to remain hopeful during times of struggle. Holocaust survivor Charles Middleburg (right) recounts his story of growing up in Nazi-occupied France to Trish Siboczy’s(left) eighth grade language arts classes on Monday, March 27. 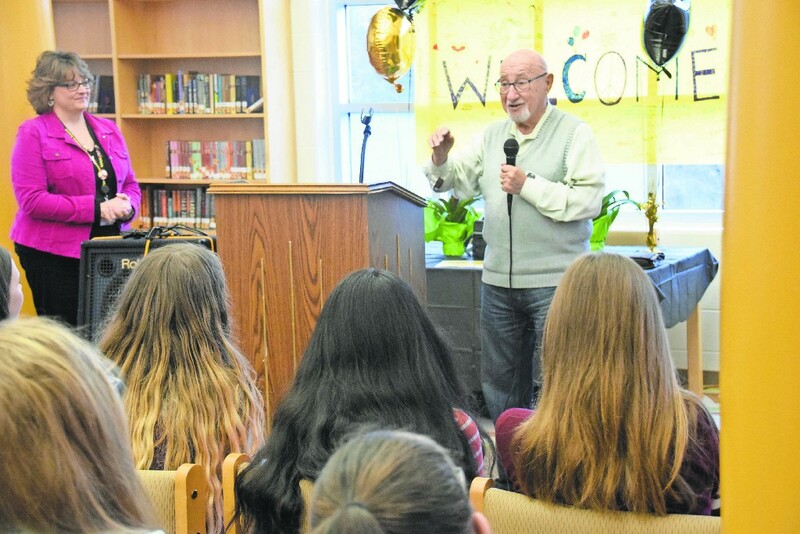 The eighth graders at Burlington Township Middle School filed into the Media Room with an excited roar Monday, March 27, but when Charles Middleburg stood to speak, a deafening silence fell upon the room as the students hung on his every word. Middleburg, a Holocaust survivor, came from the Esther Raab Holocaust Museum and Goodwin Education Center in Cherry Hill to share his story with the students who have been reading about the Holocaust in their language arts classes. Though he is called a survivor, Middleburg said his more important role is that of a witness, which is why he is booked almost every day to lecture at schools and churches. Before the Germans invaded France, Middleburg fondly recalled having a “wonderful life” in Paris at 9 years old, but all changed when German-occupied France became an inhospitable place to be Jewish. In the spring of 1941, Middleburg’s father received a letter summoning him to city hall along with 9,000 other Jewish men. The men were informed they now worked for the German military and initially bused to a camp miles away from the city, but several months later the 9,000 men were taken into cattle cars and shipped to destinations unknown to the families waiting to hear from their loved ones. With no word from his father, Middleburg’s mother was unsure where to turn in July 1942 when she heard a rumor that German soldiers and the French police were planning a massive raid on Paris to capture Jewish men, women and children. She sought the counsel of their apartment building’s janitor. The janitor, an injured World War I veteran, showed the family a small maintenance closet with a trap door on the building’s top floor. The janitor devised a plan to alert the family of a raid by taking the rubber off his peg leg so his walk would thump loudly against the building’s wooden stairs in case of a raid. One night, they heard the thumping on the stairs and raced to their hideaway where they stayed until noon the next day when Middleburg’s mother encouraged him to sneak down to the streets for food. After another night of hiding, they fled their apartment building to sleep in the streets for the next few nights. Middleburg’s mother sent him and his younger brother to a farm in the countryside explaining they would be safer there and she could move faster on her own. Middleburg and his brother stayed with the farmer and his family until he received a letter from a woman containing his mother’s ring. The letter’s author saw his mother caught in a raid, and she offered to have the boys return to the city to stay with her. Years later, Middleburg found a book that revealed his mother had been taken to an extermination camp and killed immediately. At the time, Middleburg was 12 and his brother was 8, and he thought he would have a better chance of reuniting with his mother if he returned to Paris to stay with this woman. His younger brother returned to elementary school, but Middleburg could not because registering for complementary school required records that would expose him as a Jew. So Middleburg worked in the woman’s cafe and offered to do the homework brought home by the women’s children. One day, the woman brought Middleburg and his brother to a Catholic priest, who — after a few words in Latin — informed the boys they had just been baptized Catholic. To evade suspicion, Middleburg and his brother became “the best little Catholic boys,” with Middleburg even becoming an altar boy. Life continued on with Middleburg working in the cafe and attending mass every Sunday until Paris was liberated in August 1944, and exactly one year later, Middleburg and his brother were reunited with their father who they found out had been shipped to Auschwitz concentration camp. Middleburg’s father revealed he survived because he was one of the first watchmakers at Auschwitz, so the Nazis instructed him to fix the valuables they confiscated. After the war, France held too many heartbreaking memories for the family, so Middleburg’s father located his brother in Philadelphia. Five years after applying for visas at the U.S. embassy, the family relocated to Philadelphia where Middleburg made up for his lost education, eventually earning his master’s degree in electrical engineering from LaSalle University. 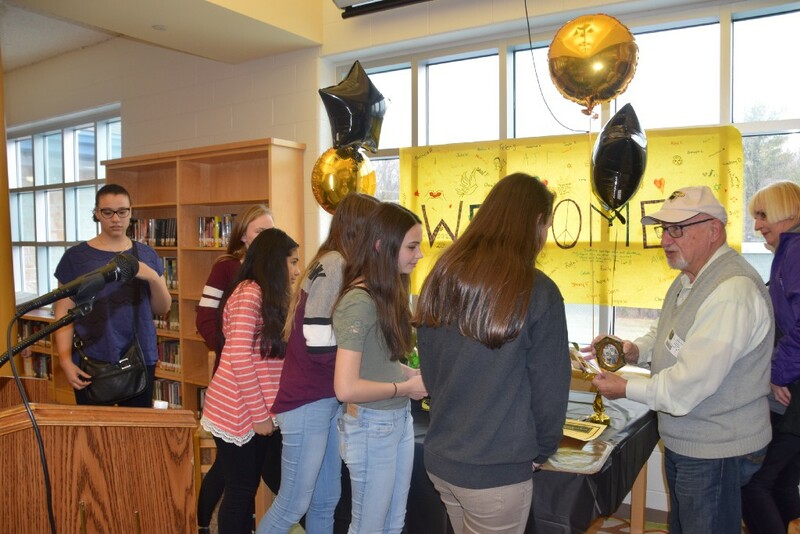 With his own education taken away for several years, Middleburg stressed the importance of schooling to the students of Burlington Township Middle School, and he urged them to cherish their time learning. Eighth grade students at Burlington Township Middle School at Springdale line up to examine the photos of Charles Middleburg’s family that Middleburg recovered after World War II ended. Eighth grader Caheil Powell said the books they read in class about the Holocaust always felt removed, but Middleburg’s words allowed her to immerse herself in the history. “It made it seem more real,” Powell said. Despite experiencing horrible tragedy, hope was the main message Middleburg wanted to share with the students. He said living a perfect life is impossible, and so students need to remember to persevere during times of struggle. This message particularly resonated with eighth grader Nathan Klinger who said Middleburg’s attitude toward struggle inspired him. “I think the message was about going through rough times and staying hopeful,” Klinger said of Middleburg’s speech. Middleburg also stressed the importance of avoiding hate groups and told students to remember that everyone is part of the human race. “Everybody when they cut themselves bleeds exactly the same red blood — no question about that,” Middleburg said. 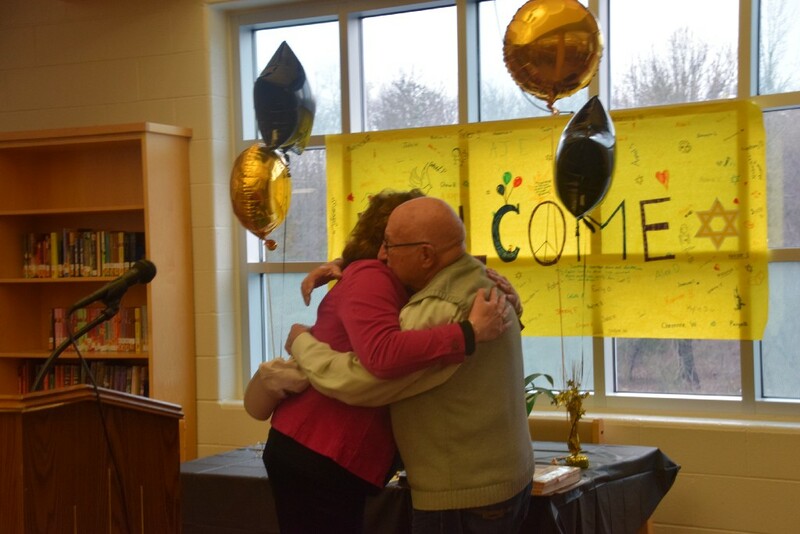 Eighth grade Language Arts teacher Trish Siboczy (left) embraces Holocaust survivor Charles Middleburg (right) and thanks him for sharing his story.